Warrior Working Women will be a regular feature here where I "interview" working women to find out how they manage their lives. This is inspired by how I don't know too many working moms in real life so get inspiration from! Everyone has different protips they can share about juggling everything and I'm excited to share those with you. if you want to nominate someone (or yourself) to be featured, contact me. 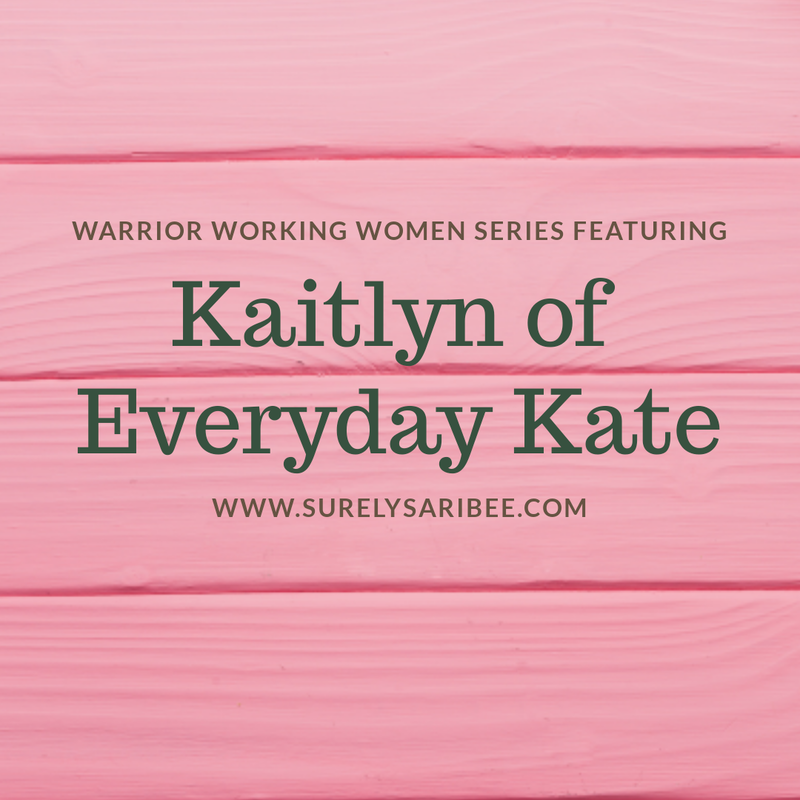 First up is Kaitlyn, who blogs at Everyday Kate. She's mom to Ezra, who is about a month younger than my own son. My baby and I were recently pictured a few times in her recent post about babywearing! Kaitlyn and I went to the same youth group as teenagers. 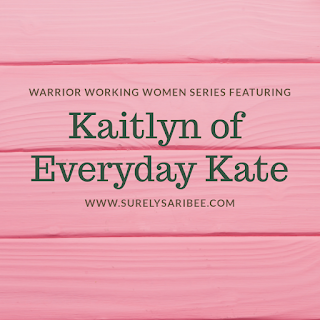 She started out as a work-from-home mom but she recently made the transition to working part time outside the home. She somehow manages to plan and make healthy meals for her family, blog and work! What "kind of mom" would you say you are? - Hmm, this is a difficult question to answer! I always consider myself a "real life, average" mom. I'm not one of those moms who has her ducks in a row 24/7, but I also don't think I'm the opposite: scatterbrained or disorganized 24/7. I have my "pajamas all day" days (multiple times a week), but then I also occasionally have days where I wake up, put myself together, get the house cleaned all before the baby wakes up. How and why did you decide to be a work-from-home mom when your son was born? - My husband and I made a very personal decision not to send Ezra to daycare, so while I was still pregnant, I started making arrangements with my job at the time to transition to working remotely. I feel as though I lucked out, because a friend of mine within the company also worked from home, so I kind of used her experience as leverage to make my case. Thankfully my boss at the time was very open to the idea. What was the most challenging part about transitioning into working motherhood and how did you confront it? - There were many different challenges for me, including overcoming my expectations of what I THOUGHT working motherhood would be like (I thought it'd be so easy, HA!). Probably the most challenging part was trying to meet my job expectations while also dealing with Ezra's erratic schedule and constantly developing skillset and personality. At first I tried working during nap times only, but then if he was having an "off" day, that plan would fall through. Eventually I realized that the only schedule I could control was my own, so I started making changes like waking up much earlier to begin work. What went into the decision to transition to part time work outside the home? - There were a lot of things that went into the decision, but one of the main things was Ezra's rapid development as a growing baby. A baby who would once lay quietly on his play mat near my desk was now crawling towards electrical outlets, toppling trash cans, eating paper; it was nearly impossible for me to work with one eye on the computer, and the other eye on the baby. On top of that, there was a staff shortage at the company and now extra work was being pushed my way by default. I was definitely in over my head at this point and knew I needed to make a change. How do the challenges compare between being a work-from-home mom and your current situation? - The challenges of being a work-from-home mom were mostly physical, and working away from home the challenges are more on the emotional side. For example, while at home, I would be physically juggling housework, my job, and the baby, while still trying to maintain my sanity. Working away from home, however, has been emotionally challenging because the evenings that I spend at work, I feel saddened to be away from Ezra. I am currently still breastfeeding him, so it is emotional for me not to nurse and cuddle him before bed. At times I feel guilty for leaving him for such a long period of time. What does the division of labor look like in your house? When does stuff get done, how, and who does what? - Ever since my husband and I have been married, we've always had a pretty good system for sharing the housework and getting things done, and I'm very thankful that we seemed to carry those habits with us as we made the transition to parenthood. He works full-time during the day, so when I am home with Ezra during the day, I try to get as much done as I can within reason. I will vacuum, unload and load the dishwasher, keep the toys tidy, occasionally do a load of laundry or two if it needs done. Then, when my husband gets home, he plays with Ezra, gives him a bath and gets him ready for bed while I cook dinner. Once Ezra is in bed, my husband cleans up the kitchen. On the weekends, we basically take turns doing little things that need done, whether it be laundry, cleaning the bathroom, dusting, vacuuming, etc. We have a pretty good ebb and flow to our cleaning routine, and once we're done we both sit on the couch and veg out in front of the TV, play with Ezra, or take a walk. In our family, we value, cheap, quick meals so a lot of the things I plan aren't the healthiest for sure. How do you manage to get healthy dinners on the table while being a working mom? - We also appreciate dinners that are on the cheap & quick side, but I try to be diligent when it comes to making those cheap, quick meals also healthy and full of nutritional value. For us, this means a lot of repeat dinners, and quite a few leftovers. I fell out of love with my crock pot after it did me wrong one too many times (haha), so now I usually either bake our meals in the oven, or in the Instant Pot on nights I have to work, and then when I'm home, I will spend more time at the stove or make a more "elaborate" dinner. It helps that I really love cooking, being in the kitchen is like my "me" time for the day. My husband is not keen on cooking, but he is good with directions, so usually I will spend time (usually during Ezra's nap time) chopping veggies, marinating meat, or doing other preparations and leave everything in the fridge. Then, when my husband gets home, he can dump everything onto a tray and into the oven, or into the Instant Pot, you get the idea. Healthy meals that are really easy for me to prepare ahead of time are one-pan baked salmon and roasted vegetables, roasted sausage and vegetables over rice, a whole roasted chicken (bakes for two hours in the dutch oven, I just throw it all in when I'm leaving for work), and beef stew in the Instant Pot. All of that being said, it's important to know that not every single meal every single week is as healthy as can be - my husband and I ARE real people and we do eat our fair share of takeout and fast food, and I buy him a frozen pizza once a week just in case I didn't have any time to prepare anything or I just didn't feel like it! !